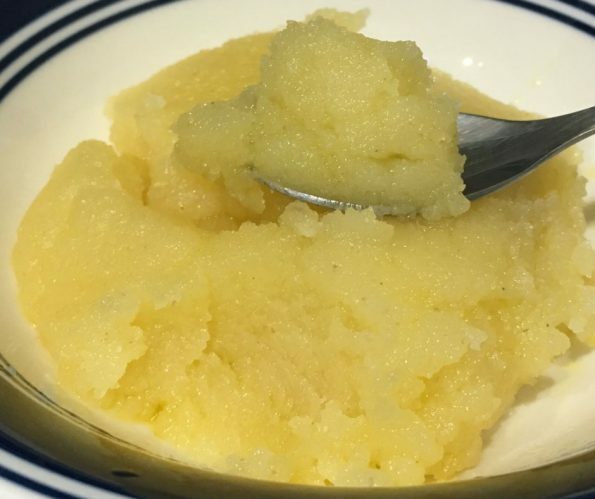 This easy recipe for sooji halwa uses no milk but this is not a dairy free dessert as we use ghee to make this easy, quick and delicious Indian dessert. Ghee is absolutely an essential ingredient for this recipe for sooji halwa, as ghee is what adds much flavor to this Indian dessert which you can prepare so quickly. Halwa (there are many varieties) is an Indian dessert which is made of mainly flour, sugar and ghee along with other ingredients, and it is basically a very delicious Indian style pudding. And sooji halwa is made using sooji flour which is course semolina wheat flour and this sooji halwa has a very soft, melt in mouth like texture and it is very delicious too. The best thing about sooji halwa is that it is one of the most easy and simple Indian desserts which you can make so quickly. This is also a very popular festival sweet prepared in India with minimal ingredients. Sooji flour (semolina flour) is also known as rava in South India. I recommend using very good quality ghee for the best flavor and results. If you are not familiar with the term ghee, it is nothing but clarified butter popularly used in Indian cuisine and you can see that ghee is very much used in Indian desserts which make them so rich and delicious. Cashews and raisins are fried in ghee and added to the halwa at last, which makes it more delicious and flavorful, however my kids do not care for the nuts in ths halwa so I made it without nuts. In the recipe for sooji halwa, I include directions for using the nuts, as it is the authentic way of making this dessert and when you are making sooji halwa, you are expected to add the fried nuts, although you can skip this if you don’t prefer it. How To Make Easy Sooji Halwa? This recipe for sooji halwa is so easy, quick and simple to follow and you can make this dessert within few minutes. Other than ghee, the most important ingredient that we use here is the slightly coarse semolina flour, which is popularly known as sooji or suji in North India and in South India, this flour is popular known as rava flour, which is basically semolina durum flour which is slightly coarse in texture. 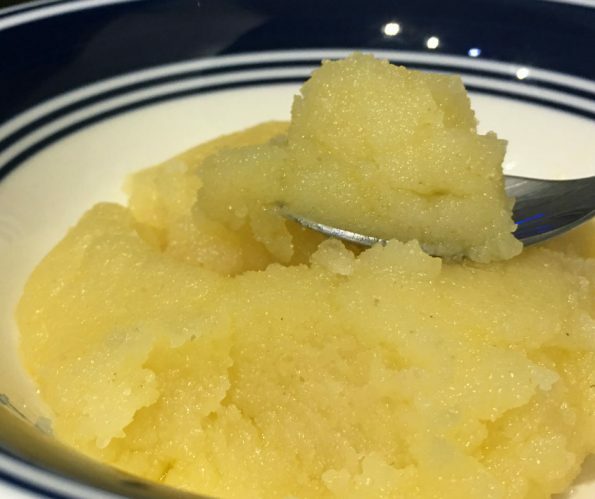 Sooji/semolina flour is used in many Indian recipes including dessert recipes and most of the recipes using sooji flour is super easy to follow and make (the cooking time for this flour is very less) and they are delicious too. See easy breakfast recipes using semolina flour like simple semolina porridge recipe, masala upma recipe, simple sooji upma recipe etc. Sooji laddu (sweet semolina balls) is another very popular and easy to make dessert using sooji flour or semolina flour. So here is how you can make easy, quick and delicious sooji halwa following this simple and easy sooji halwa recipe. This easy sooji halwa or rava halwa made of semolina flour without using milk is a very delicious and quick Indian style dessert which you can prepare in few minutes. Dry roast the sooji in a large pan or kadai for about 2 to 3 minutes until raw smell goes away. You can skip this step if you are using roasted sooji flour. Add ghee to the dry roasted sooji and roast again for another 1 minute until the sooji is roasted in ghee. Add water to the sooji and cook in medium heat, while you keep stirring. Once the sooji is cooked and almost all the water is evaporated, add the sugar to the pan and stir well until the sugar is almost dissolved which takes about a minute. Stir well to remove any lumps that may form which can be easily remove by stirring. Continue to stir and cook in low to medium heat until the halwa starts separating from the sides of the pan. This step will take around 2 to 3 minutes of total time. Once the halwa is done, keep the pan separate from heat. Heat the remaining one tablespoon of ghee in another pan, lightly fry the cashews and raisins until golden brown. Add the fried cashews and raisins (along with the ghee) to the sooji halwa and gently mix in, you may also keep a few fried cashews and raisins to top the halwa. Serve the sooji halwa while it is still warm for the best results! 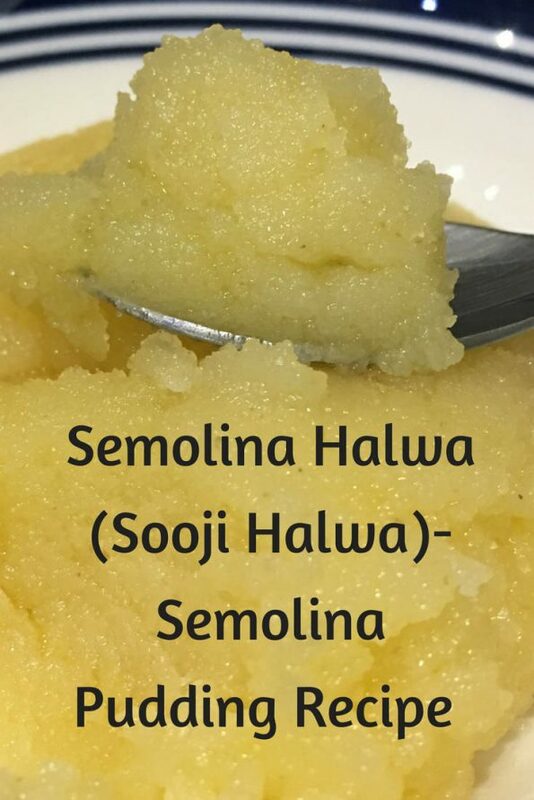 This is a very simple recipe for sooji halwa which you can follow and make the halwa in less than 10 minutes, so it is a super quick dessert as well, which will give you sooji halwa which is not overly sweet with a very smooth and silky texture, which is kid friendly as well. If you do not want to use fried cashews and raisins you may skip them, but I recommend adding the extra ghee (and also one tablespoon of sugar if you like) at the end of preparation which will ensure a silky smooth texture for the halwa. 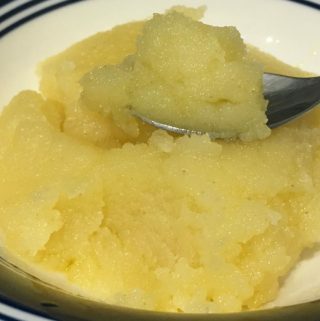 Hope you found this post on recipe for sooji halwa without milk helpful in making easy, quick and delicious sooji ka halwa for a really quick Indian dessert!